This is a transcript word for word from an audio tape of David Holderread discussing Ancona genetics on January 2014. 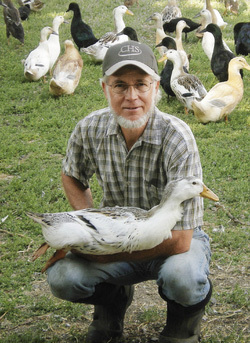 This is a somewhat complicated discussion for Ancona duck breeders. The audio is courtesy Boondockers Farm. 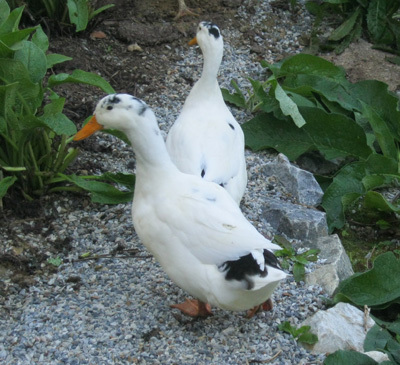 I suggest reading my other 2 pages on Ancona duck colors and genetics first unless you already have a good understanding of their genes. 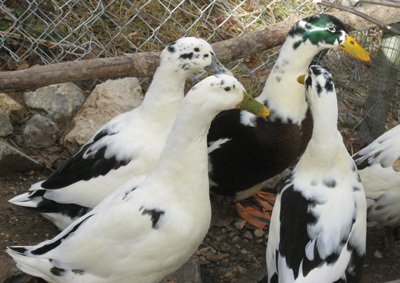 If you wanted to produce 100% Ancona-marked ducklings, you would use the Tricolored (Pied) females. The way I use that term is any bird that is not Black, Blue, Chocolate or Lavender. 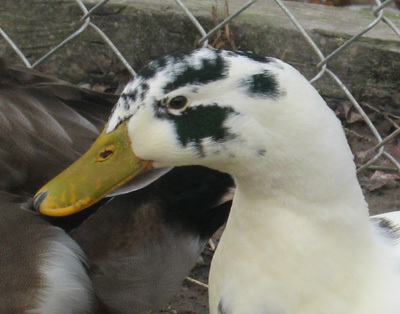 It is more Mallard coloring. You have to. The only difference between Magpie and Ancona colorwise is that the Anconas have one gene per non-spread Black. So spread Black is the foundation of Black, Blue, Chocolate, Lavender, Silver, that whole family. And it�s dominant. So a bird that carries one gene for that, it will be Black. Let�s say it doesn�t have any other modifying genes. 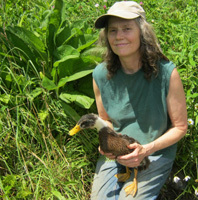 It will be a fairly dull Black duck. It will almost always have a little bit of penciling and lacing under its wings. 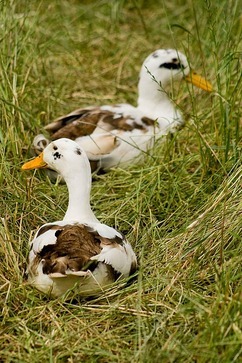 If you pick the wing up and look on the lining, there will almost always be little brown markings in those feathers. And they have rust. 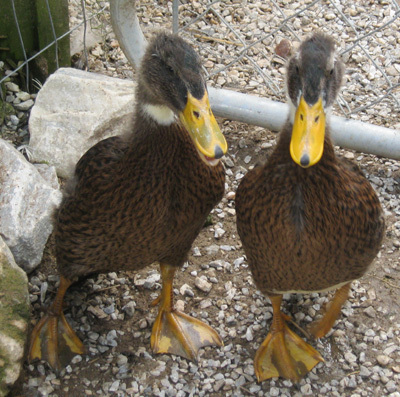 The males usually have some browns somewhere in their plumage. It is kind of reddish. Kind of like from the chest of a male Mallard. It�s not really related to that but it can be about that color. Those birds (Anconas) are heterozygous for black. (Heterozygous: a pair of genes where one is dominant and one is recessive� they're different.) They have one black gene at that loci and they have one wild type gene. 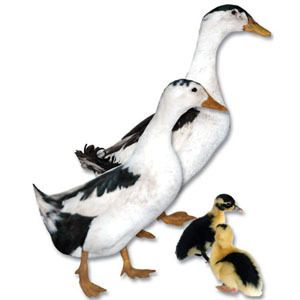 Then they have the dominant bib and they have the Runner (duck) pattern. That is what a true Black Ancona is. If you mate two of those birds colored like that, a quarter of their offspring theoretically will be wild type at the spread black locus. So that�s how you get those birds. If you don�t have that gene, then they are Magpie marked. If you have well-marked adult breeding Magpies, and you hatch 1000 babies out of them. If you get 50% of those that have show quality markings, it is an unusually high percentage. Because the combination of Runner pattern, dominant bib, and spread black, is real inconsistent in the way it is expressed. Any one of those is fairly inconsistent. The combination of all three of them really makes the expression of the pattern inconsistent. People just arbitrarily decided what pattern they wanted it to be. It has nothing to do with nature per se. So there�s no reason for that exact pattern. It is always Black and white as long as they are homozygous for black. (Homozygous: a pair of genes that are the same.) So the Ancona is heterozygous at the black site. The Magpie is homozygous, pure. That is the only difference in color. When you have Blue or Chocolate, then you get the other. That�s the only difference in the color. It�s all the same. 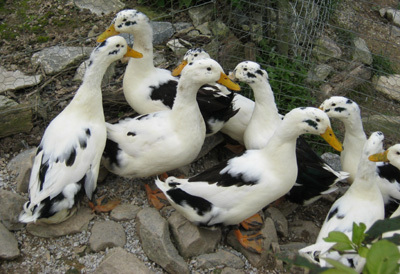 So if you have some females that have the Pied (Tricolor) pattern, there�s different names for all of these. I just call them Tricolors. It doesn�t matter that if they have Blue dilution or Chocolate dilution or whatever. It tells me genetically those are the birds that are homozygous. They have no black genes. 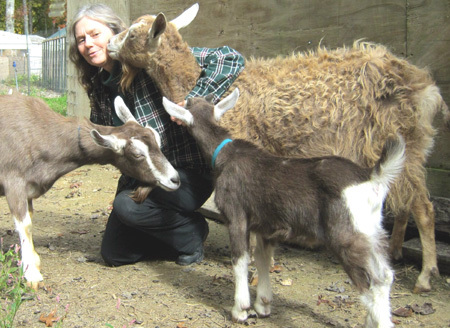 They are homozygous for wild type. 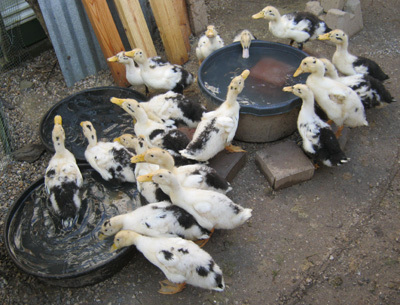 If you have females like them and mate with these drakes, then every baby will look like an Ancona (pure). The offspring get one of the pair of each chromosome from the mother and drake. And the mothers do not have spread Black. These have spread Black so you know the offspring are going to heterozygous. So that�s what the Ancona pattern is. Usually there are very few breeds where you can cross two breeds and basically end up with purebreds. There�s no indication of any difference between Magpie and Ancona other than selecting for different color patterns. I can�t think of another situation where that�s true. Unless you�re talking about different colors of the same breed. That�s basically what this is. It�s two different patterns in the same breed except they were given different names at the turn of the century. That�s what I was able to trace out. It�s not written in stone. I�ve seen where people have written that it�s in stone, that�s baloney. I say this looks like what probably happened. It is not a fact. There are very few facts. And very few facts on Magpies. And Magpies have been much more prevalent than Anconas through the last 115 years. And there�s so little documentation on them (Magpies). I pay no attention to eye color. The problem is whenever you have a bird with both white and color in it. In general if there is color around the eye, then the eye is brown. If there is white around the eye or a touch in it, then it�s blue. But in terms of pigmentation, it is irrelvant. You�ll notice birds that have split eyes or quarter. It�s not an exact proportion. Part of the eye is one color, the other part is another color. There are breeds of pigeons I used to raise. It called for those. There are always breeds that have white and color. The Western mentality is to want to make this stuff that this is the way it is (fact). The further physicists get down the road, the less answers they have about very specific things. Some areas they have no idea. Maybe, possibly. So with the Ancona it is arbitrary (about colors). You can pick brown, or you can pick blue. You are going to eliminate a whole group of birds. It�s just chance the way pigmentation blotches on that bird. The whole point is to have a blotchy, broken pattern. That�s it. So our rule of thumb was the bird had to be at least a quarter white or a quarter color. It�s arbitrary. You�ll get some pure white ones. Obviously we never bred from those. That�s one reason why we never standardized them. We knew as soon as people want it exact, then it will ruin the breed because you�ll throw out such a large portion of the birds. Your gene pool is so small anyway. You�ll run them into the ground genetically. "Two have hatched! 5 more are moving well. They are adorable & healthy!!!" "This little one just hatched. It pipped into the back of the shell and away from the air cell. He had been working since early yesterday and was tiring out. I assisted just a tiny bit and very gently." "When it pushed out of the egg, it was fully twisted and looked like origami yoga. It is breathing well and peeping strongly in between naps. This one worked and worked to get out!" These 3 photos are from Shelly. Stay at my Vacation Rental on the farm. I ship to the United States only. 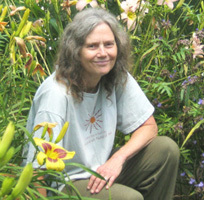 Please support small farms and sustainable living.